We didn't get the early start we had hoped, but enjoyed a low-key morning as we got ready to go. John and Marge got about a 1/2 hour start on us, but we arrived at Ruby's Inn just after they had checked in at the RV office. We stopped by after we got registered and discovered we were a couple loops down from them. We got a nice flat pull-through site (113) that didn't even require that we unhook the Explorer to pull in. We got everything hooked up without incident. We made "lunch" and then drove to Sunset Point to photograph sunset. The skies were overcast, but there were isolated areas that were lit. 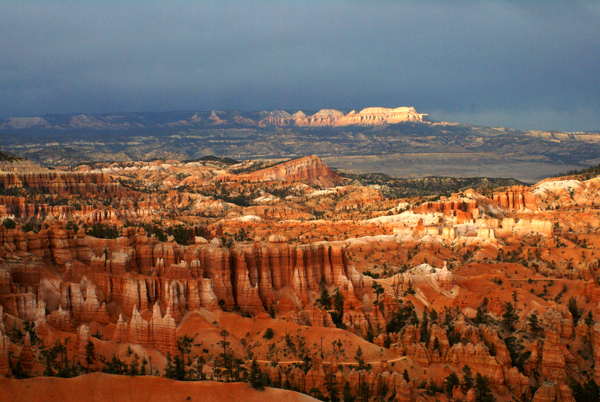 The clouds produced a soft light for the formations in the canyon. 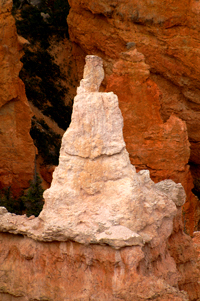 The light colored formations seemed to contrast sharply with the pink and brown formations around them. The scene didn't really look that promising, but using a long lens and isolating them gave the lighter formations life. 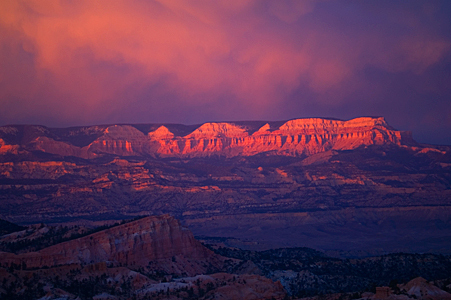 Just as we were about to leave, the Aquarius Plateau began to light and the clouds above them looked like pink drapes. Although it didn't reproduce well in the camera, it was magical.